TARA labs new; Apollo Extreme is a brand new interconnect from TARA Labs. Using a new specialized conductor and proprietary dielectric material that is specifically manufactured with entry-mid level audio component systems in mind, the performance result is nothing short of stunning! 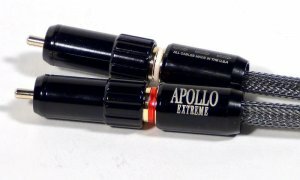 The Apollo Extreme is “extremely” transparent,with high frequency extension, as well as being open, fast and accurate with precise resolution. It’s actually quite detailed considering the retail price, and would certainly enhance any audio system with a great “upgrade” in sound performance. The Apollo Extreme is custom hand-crafted in Oregon, USA, and lifetime guaranteed.